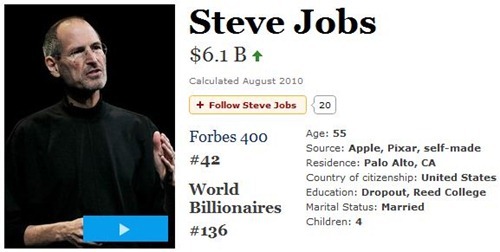 Forbes recently updated their 400 Richest Americans list and well, let’s just say that a certain 26 year old iPhone-hating Facebook CEO is now worth more than you can ever be. Now worth a whopping $6,900,000,000 ($6.9B), Mark Zuckerberg is also the youngest billionaire in the world. His wealth has, of course, accumulated from the world’s most popular social networking website Facebook. Like most other billionaires, Zuckerberg is a drop-out (from the prestigious Harvard University). He came up with Facebook in his days at Philips Exeter Academy when the academy annual published a book which featured headshot photos of students, faculty and staff. This book itself was known as the “Facebook” among the Academy. Since then coming up with the idea in 2004, coding Facebook in his dorm room at Harvard and shifting to Palo Alto, CA; Facebook has become a phenomenon. With over 500 million users, it is the most popular social network today. Other notable rich men belonging to Silicon Valley include Microsoft founder Bill Gates (who is still at the top with $54B), Microsoft CEO Steve Baller ($13.1B), Google founders Larry Page and Sergey Brin (at $15B) and Dell founder Michael Dell ($14B).